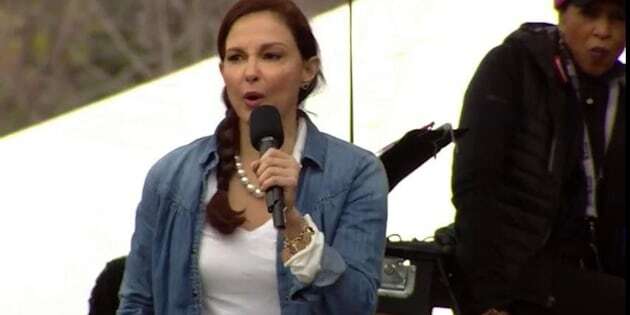 Ashley Judd is a nasty woman, and proud. The actress and activist appeared on stage at the historic Women’s March on Saturday to deliver a stirring poem in celebration of all the powerful, fierce, and brilliant “nasty women” out there. Judd shared the poem with permission from the author, 19-year-old spoken word poet Nina Donovan, who originally performed the poem in December 2016. In front of a crowd of thousands, Judd recited Donovan’s fiery lines, calling out a wide array of intersectional injustices. This included everything from police brutality and mass incarceration to the gender inequalities in the work place. Judd went on to speak about the need for women to have autonomy for their own bodies, to not have to be embarrassed by their periods and then taxed for tampons and pads when men don’t get taxed for Rogaine or Viagra. Watch Judd recite the full poem above.